Check out my resources page if you are interested in knowing what I am using. My cantilevered planer cart is holding up just fine. No problems and I don’t expect any. Custom screwdrivers are inexpensive, easy, and a great gift. New microphone? No. Just relocated to my hat. Hopefully it’s more consistent. Sinus update: Allergy injections have helped a lot! Dewalt 735 planer broke a gear. Derailed momentum for a bit. It’s fixed now. First time I’ve had to ditch video footage. Updated shop tour with Shawn Stone. The video will hit the interwebs very soon. Cutting a log tomorrow with Shawn Stone. Always appreciate your honesty Jay. Don’t be too hard on yourself. You put out some good solid content. Hi, Jay. I’ve had the same experience talking to the camera. I just recently completed a 30-day video challenge and found that it is much easier for me to talk to a camera than to a person. I am an introvert as well, and I deal with social anxiety. Talking to the camera has helped with both of those things. Don’t sweat your communication skills. I think you do a great job. Also, one of the things I learned in the video challenge is that talking with your hands is more natural and viewers will connect better with you. They actually encourage people to talk with their hands on camera. So I say keep it up. By the way, I love the lav mic clipped to your hat. I’m just getting started with my YouTube channel and might have to borrow that idea. 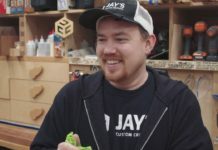 Jay, if perfect grammar and professional presentation skills were requirements for Youtube and other online videos, 90% of them would be deficient. I have never been unable to learn or enjoy one of your videos because of how it was presented. I’m sure based on your subscriber numbers most people are in no way annoyed by your public speaking skills. I look forward to your postings weekly, so just keep ‘fiddling’, stop the analyzing and focus on what you do so well! JMO. OK, so I just watched the rest of the video; past the cantilever cart…and I feel terribly. Please forgive me. I was thinking of it was regional…you know a southern thing. Plenty of my southern friends split words because of the drawl that I didn’t even think it was anything else. Sorry. I have a silly question, what is that clear bottle of liquid on your table in that video? Is it just water or some kind of glue/finish? Jay as a retired college professor with 31+ years in the classroom I think you are a damn good communicator. Better than most tv news anchors. Keep the videos coming. I love that you don’t always get the words right, you don’t cut out miss speaks, and you understand your limitations and work towards fixing them. i have all the time in the world for people that get and make themselves better. 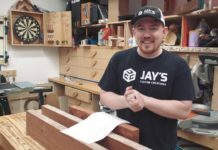 Love your videos and down to earth approach to woodworking. Keep up the good work. I don’t care of you talk like a chimp on PCP, I still like your stuff.